The arrival of May, for many other sports CCAs, meant that their competition seasons were over. For the badminton team, however, it meant that the most intense period of their competition was yet to begin. With the girls and guys teams having given their all in their trainings and preliminary rounds, it came as no surprise that both teams qualified for the Grand Finals, held on the 21st of May at Bedok Sports Hall. The boys team faced-off against ACS(I), while the girls’ team was up against River Valley High School, both of which have been long-time opponents of the teams. For the teams to clinch the gold medal, they required to win a minimum of 3 out of 5 matches to claim the gold. For 8 consecutive years before this the girls team had brought back the Gold for Raffles, and this year was no exception. After months of intense training, the girls emerged victorious. The singles winner and Team Captain, Chong Fui Jin, went against a strong competitor from River Valley High School. The intensity of the match was evidenced by the fact that the points were never too far from one another – supporters of both sides were kept at the edge of their seats. 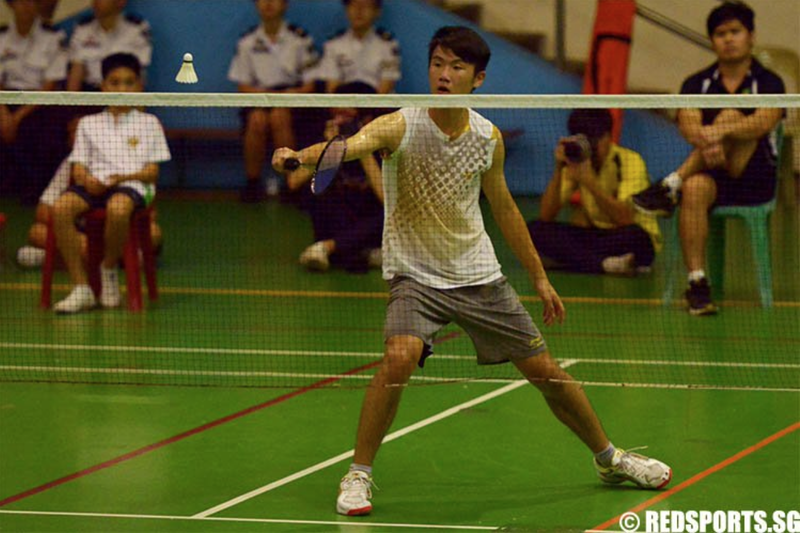 The first game was taken by Fui Jin, edging the opponent out by a score of 21-19. Unfortunately, a fault was found in the flooring of the court and the match had to be disrupted, with the girls having to wait for another court to be freed up. Fui Jin refused to let this faze her, however, and did not let the second game go down without a fight. She won the second game 21-17 and thus the match as a whole, getting the ball rolling for the girls team on a high. 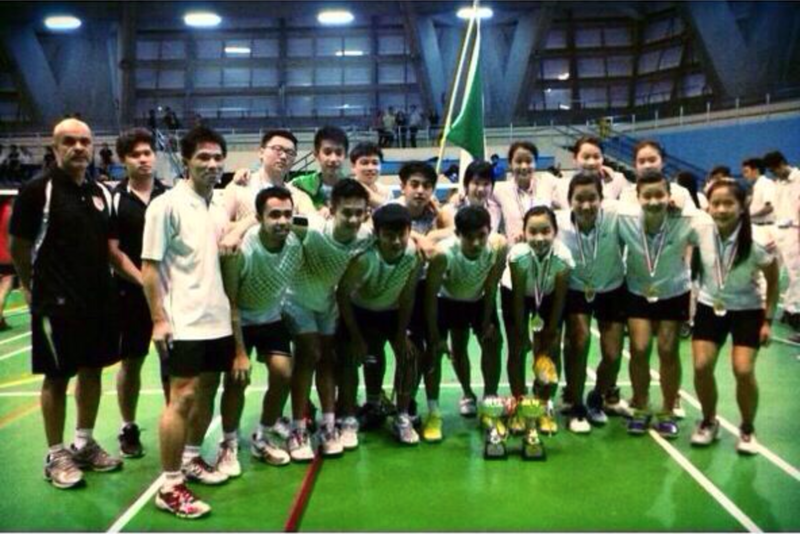 Both doubles teams, comprising Lee Shuzhen & Kelly Tan, Joy Teo & Chiu Jingwen did us proud as well. They showed dominance in their respective games and maintained great control of the shuttlecock most of the time, beating their opponents with flair. For the first doubles game with Shuzhen and Kelly, it was clear from the beginning that our girls were a force to be reckoned with. The first game was a thrashing with the Raffles players taking the game 21-4. However, RV did not back down and bounced back in the second game, putting their all into their defenses. Ultimately, Shuzhen and Kelly could not be beat and took the second game 21-17. Joy and Jingwen were nothing short of brilliant as well, with powerful offences and smart defense allowing the pair to take the lead in both games. The first game kept on-lookers nervous as the scores stayed an inch away from one other. Eventually, our supporters heaved a sigh of relief a our girls took the game with a score of 22-20. 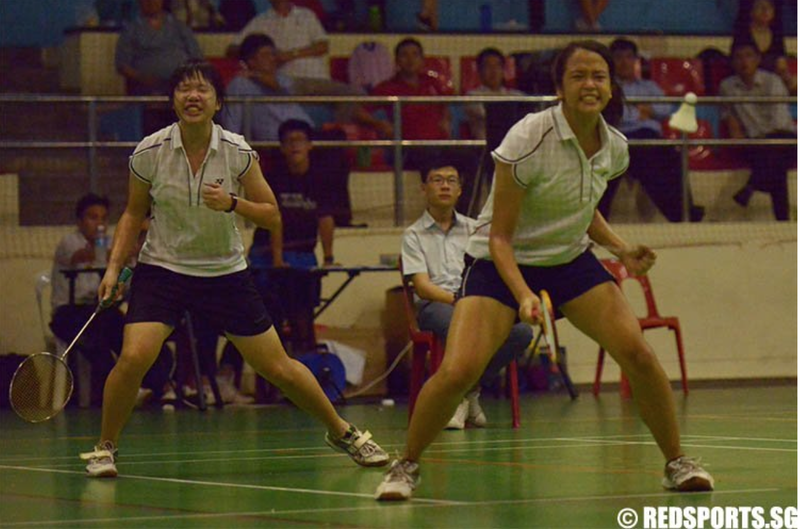 The second game was close as well but Joy and Jingwen pulled ahead strongly to take the match 21-16. One of the most intense matches for the day was by Marissa Ng and her opponent. Marissa started strong with the score of 8-3, but her tough opponent caught on, pressurizing with tricky passes and proceeded to win the first game. However, not being bogged down by the initial disadvantage, Marissa entered the second game with a strong fighting spirit and returned powerful strokes, overtaking her rival towards the end of the game and emerged the winner by 5 points. She went on to the third set and put up a strong defence; however, her opponent won the game marginally at 21-19 and thus won the last match, taking home the last win for the day. Despite that, Marissa’s remarkable determination was felt and her match was nothing short of memorable. Third singles player Rene was fired up for her match and played the first game amazingly, beating her opponent 21-10. Unfortunately due to the lack of time, she was unable to complete her match. Well done to Rene regardless for giving her all! Muhammad Imran Khan, captain of the Boys’ Team, was unfortunately not able to play due to an elbow injury. However, we salute him for all the hard work and spirit he has put into supporting his team every step of the way. Nigel Siew, first singles representative of RI kicked off the finals on a high, staying consistent throughout. While the opponent from ACS put up a tough fight, Nigel’s deftness and skill throughout both sets meant that he was clearly the dominant player in this match, eventually winning by a fair margin for both games: 21-14 and 21-12. The first doubles match, played by Li Zheng Xi and Qi Xue Qian, was unfortunately not as successful as Nigel’s. The match was an extremely tough one, with ACS(I) proving to be a difficult opponent throughout. Strong offences on the side of ACS(I) and lightning-quick responses to our attacks meant that defending was an uphill battle for Zheng Xi and Xue Qian. Trailing behind 21-18 in the first game, the pair fought back under the encouragement from the supports above and kept the scoreline nail-bitingly close. Unfortunately, ACS(I) edged us out with a second win of 21-16. Nevertheless, a resounding Kudos to Zheng Xi and Xue Qian for fighting their hearts out and doing us proud. It was a nerve-wracking, challenging time for the second singles played by Daryl Ng as he went up against his opponent from AC. It was clear that Daryl was nervous and under immense pressure and the opponent was especially strong on the offence, with powerful smashes often catching Daryl off-guard.This consequently led to Daryl falling behind in the first game with a scoreline or 21-9. However, Daryl never once gave up. He kept going and took on the second game with a vengeance, this time more deliberate with his plays. Despite ultimately losing to ACS(I), he bounced back in the second game with a score 21-17, his perseverance and grit an inspiration to all who were there to witness the match. The second doubles match played by Jackie Tan and Donovan Mui was equally tough and it was nail-biting for all supporters to watch – the results of this match could either lead ACS to victory or move the players into a tie-breaking third singles. The first game was taken by ACS(I) by a mere 2 points, ending at 21-19. Tension and excitement could hardly be contained in the second game, with the score being incredibly close throughout. So close, in fact, that the game concluded only at 24 points. Both sides put up an awe-inspiring display of teamwork and finesse, exchanging skilled passes and working strong defenses. However, ACSI pulled ahead to claim the match 24-22. It was a heartbreaking moment for Raffles as it came to light that it meant the game was over for the boys’ team – ACS(I), having won 3 out of 5 games, took home the championship title and Eng Chin An was not required to play his third singles match. Regardless, the battle fought by the boys, with matches described by supporters as “intense”, showed us that you don’t need the gold to be an inspiration to others. To quote Jim Courier, “Sportsmanship for me is when a guy walks off the court and you really can’t tell whether he won or lost, when he carries himself with pride either way.” The boys fought hard to get to the finals – an achievement that should not be undermined at all – and strived on till the very end. Neither should this lessen the greatness of what the girls achieved either – they were amazing indeed. But at the end of the day, we are simply proud of both teams; of their tenacity and teamwork, of the heart and soul they pour into the sport. We know that they will come back next year more prepared for the challenges than ever before.